We go to church, read our bible, go to Sunday school, we pray, and go about our lives with our human knowledge and human sight; and seemingly unfortunate lack of ability to see into the future. Psychologists talk about children and teenagers not being able to “see around corners.” What they mean (I think) is that kids don’t know how to think ahead far enough to foresee the end result of their current actions. When we ask why they would jump off of the couch onto their little brother, expecting them to know, we as the adults are actually doing so in folly. They really don’t know, and couldn’t predict harm. Their brains aren’t done growing, and they didn’t (previously) have the context to realize what could happen. But we adults have experience that allows us to see ahead, and logically predict results. That’s a benefit right? Well that depends. Children who can’t see possible harm, also trust that it will work out. And really it usually does, even when flawed parents drop the ball. (And that I do.) They believe that things will be okay. Children believe it even unto to death. Christian parents know this well, however if for some reason we have to live through the ‘even unto death’ part . . . we find it almost impossible to see around the corner and believe it will be okay. Our adult minds, with our adult experiences have given us reason to think it might not be. And its much easier to accept ‘even unto death’ if it’s our own. But when we’re faced with the death of a loved one, it’s so much harder. We can’t see them, nor can we logically predict our lives without them. The thing is we don’t have to be logical when it comes to trusting God. We don’t have to know everything, we don’t have to do anything. We can mess up everyday, be happy, be sad, maybe be on our game; just hold out hope in Christ. Let go and be faithful until death, and God will give us the crown of life. If you google prayer journals you will find it overwhelming. There are so many ways to journal your prayers, from simple to complicated. Here is a pic of my prayer journal. I love making things myself! It is therapeutic and so fun to be creative. (God is creative and so He has made us to be creative in His image!) I just took a plain spiral notebook, divided it up in sections (prayers of thanks, pleases, family, friends and others, and bible verses), and made a pretty cover for it with scrapbook paper! As you can see, I started out color coding my prayers (my OCD) but have not really been able to follow it so I just write with any color pen. In the back cover, I have an excel spreadsheet I made for organizing prayers so that once a month I cover the things I want to remember to pray for… here is the link if you would like to see it. Years ago I was at a Christian gathering which ended in a prayer circle. People were lifting up prayers for a variety of people and reasons. I had a special prayer request. A friend, who was there, had recently been diagnosed with cancer. I wanted to pray for her, but I am shy and don’t speak up easily in larger groups. Plus, I wondered if she wanted everyone there to know about her illness. I wanted to pray for her, but I was paralyzed. I couldn’t seem to get it out. I was afraid of doing or saying the wrong thing. Then a man started praying: he said he knew that many of us had unspoken prayers–things we wanted others to pray for but couldn’t express for one reason or another –too personal, too complicated to explain, too painful. He lifted up all our unspoken prayers, trusting God to know what was in our hearts and minds but couldn’t or wouldn’t speak out loud. Afterwards I went and told my friend, “that prayer was for you!”(probably for lots of others, too). Months later we were able to tell the man who prayed for unspoken prayers how meaningful that had been for both of us. We were touched deeply by his prayer. I’ve never forgotten that experience. Now in church, or in other situations of group intercession, I often add a prayer for all those that are going “unspoken.” It may be because I have an unspoken prayer of my own; it may be just because I know there are others out there who need that prayer as much as I once did. How about you? Have you had an experience like mine? Do you, or your church routinely pray for all our “unspoken” prayers? Standing right beside me, never leaving me alone? The one who died on a cross, taking our sins on that precious day. You wrap your arms around us and always listen when we call. Giving us a chance to be forgiven, helping us man our battle stations. Giving us your divine instructions and leaving us to do the rest. However unsure or nervous we are, sometimes even as painful as piercing knives. Letting us experience the calm in the storm, helping us to stay strong and steadfast. My Jesus, my friend, my Savior, who’s with me every day. I wrote this poem one night after chapel on a Via de Cristo weekend. I read it when I am going through hard things and reminded that I am never alone, Jesus is always with me. It is my prayer through the storms of life. Do you have a comforting prayer or poem that you go to for strength and comfort? Memorial Day was started after the Civil War to commemorate the soldiers that died during that war. Now it’s to remember all the service members that have died to make our land free since then. I think it’s good that we remember these selfless individuals. Many of them much younger than we are and they go out into harms way to serve our country. And not because they have to. At this time we have an all volunteer military. I still remember “The Draft” back in the 1970’s and how much hatred there was for the soldiers coming home from Vietnam. Today, these young people volunteer to serve. What courage they have! This weekend, while you may be sitting by the pool or firing up the grill, keep the family members of these brave young people in your prayers. They put their lives on the line for us. I think it’s the least we can do. Speaking of Christian art, I have a number or icons. This one is my favorite. It seems particularly appropriate since we just celebrated Trinity Sunday. What do you think? Does this icon speak to you? Does it help you understand the trinity? Might this icon help you to pray? 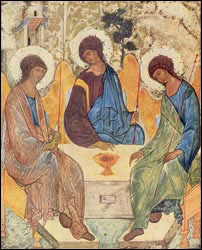 Andrei Rublev’s Icon of the Holy Trinity. The Church has many different depictions of the Holy Trinity. But the icon which defines the very essence of Trinity Day is invariably the one which shows the Trinity in the form of three angels. The prototype for this icon was the mysterious appearance of the Holy Trinity in the form of three travelers to Abraham and Sarah under the oak of Mamre. The Church specifically chose this particular icon because it most fully expresses the dogma of the Holy Trinity: the three angels are depicted in equal dignity, symbolizing the triunity and equality of all three Persons. Moscow. We find the deepest understanding of this dogma in the icon of the Trinity painted by the venerable Andrei Rublev for the Trinity Cathedral of the Trinity-Sergius Lavra. This icon is a masterpiece of ancient Russian iconography, and it is not surprising that the Church established it as the model for depicting the Trinity. In Andrei Rublev’s icon, the persons of the Holy Trinity are shown in the order in which they are confessed in the Credo. The first angel is the first person of the Trinity – God the Father; the second, middle angel is God the Son; the third angel is God the Holy Spirit. All three angels are blessing the chalice, in which lies a sacrificed calf, prepared for eating. The sacrifice of the calf signifies the Savior’s death on the cross, while its preparation as food symbolizes the sacrament of the Eucharist. All three angels have staffs in their hand as a symbol of their divine power. The first angel, shown at left, is vested in a blue undergarment which depicts his divine celestial nature, and a light purple outer garment which attests to the unfathomable nature and the royal dignity of this angel. Behind him and above his head towers a house, the abode of Abraham, and a sacrificial altar in front of the house. This image of the abode has a symbolic meaning: the house signifies God’s master plan for creation, while the fact that the house towers above the first angel shows him to be the head (or Father) of this creation. The same fatherly authority is seen in his entire appearance. His head is not bowed and he is looking at the other two angels. His whole demeanor – the expression on his face, the placement of his hands, the way he is sitting – all speaks of his fatherly dignity. The other two angels have their heads inclined and eyes turned toward the first angel with great attention, as though conversing with him about the salvation of mankind. The second angel is placed in the middle of the icon. This placement is determined by the position held by the second Person within the Trinity Itself. Above his head extend the branches of an oak tree. The vestments of the second angel correspond to those in which the Savior is usually depicted. The undergarment is a dark crimson color which symbolizes the incarnation, while the blue outer robe signifies the divinity and the celestial nature of this angel. The second angel is inclined towards the first angel, as though deep in conversation. The tree behind him serves as a reminder of the tree of life that was standing in Eden, and of the cross. The angel on the right is the third Person of the Trinity – the Holy Spirit. His light blue undergarment and smoky-green outer garment represent heaven and earth, and signify the life-giving force of the Holy Spirit, which animates everything that exists. “By the Holy Spirit every soul lives and is elevated in purity” – sings the Church. This elevation in purity is represented in the icon by a mountain above the third angel. Thus Andrei Rublev’s icon, while being an unsurpassed work of iconography, is first and foremost a “theology in color,” which instructs us in all that concerns the revelation of the triune God and the three Persons of the Holy Trinity. From the book “Thoughts on Iconography” by monk Gregory Krug.